The following article was provided by Denver Hardwood Company and is used with their permission. Any article made of wood is liable to more or less warp due to changes in humidity. Wood is a hygroscopic material which means it tends to give off its moisture to a dry atmosphere until equilibrium between the two is established. Approximately 1% dimensional change takes place with each 3% change in the moisture content of the wood. 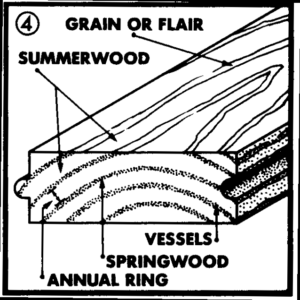 This applies to hard woods more than soft woods and maple being one of the hardest of the hard woods, the action and changes are more defined. Air can hold a certain amount of moisture at a certain temperature. Relative Humidity expresses what percentage of this maximum is actually being held by the air. Warm air can hold a great deal more moisture than cold air. For example, if we take a sample of air at 32 degrees and 100% relative humidity and heat it to 75 degrees, its relative humidity will drop to 20%. Thus we can easily see that heating the air will lower the relative humidity appreciably. From the above mentioned principles, it can readily be understood how changes in relative humidity can adversely affect wood. During the colder season of the year, outside air, which can hold little moisture, enters the room and heated to room temperature. As the air is heated its relative humidity becomes very low; if additional moisture at the higher temperature is supplied, this moisture must be supplied from items in the room. Wooden articles (since they are hygroscopic in nature) are good suppliers of moisture to the “thirsty” air. In giving off moisture, the drying action takes place in the wood. Results of this shrinking, if severe enough, can be observed by checking, delaminating, splitting and warping. Raising the relative humidity has a swelling effect on the wood and will sometimes close checks and splits. No matter how thoroughly lumber is seasoned, preshrunk, or finished, some shrinking and swelling in service is inevitable because wood is seldom used under constant atmospheric conditions. Since wood is hygroscopic and responds to changes in relative humidity, its moisture content is constantly changing. Wood in service generally reaches average moisture content and changes in relative humidity cause fluctuations about this average. These changes in moisture content do not follow immediately after the changes in atmospheric conditions due to the effectiveness of the finish as a moisture barrier. Even the best of finishes are not one hundred percent effective and they will eventually allow the wood to come to equilibrium with the air if conditions are maintained over a long enough period of time. Since relative humidity is the most important factor in keeping the wood in good condition every effort should be made to maintain a relative humidity of approximately 35 to 45 percent whenever possible during the heating season. Wood should never be stored in a damp atmosphere. Special attention should be given to the end grain so that it is completely sealed. Unit heaters are particularly harmful to wood, in that they blow hot air on the top surface only. The sudden change in temperature and the extreme dryness of the air can easily cause warping and checking. Exposure of the wood to the direct rays of the sun can cause similar damage.